Whip up a delicious taste of summer with this dairy- and egg-free semifreddo. This is incredibly simple and quick to make – and looks very pretty. A classic semifreddo is usually made with eggs but I haven’t done so for this version. And I’ve used soya cream which gives the semifreddo a truly creamy taste and texture. One to enjoy throughout the summer! Place the strawberries, honey and vanilla extract in a heavy-based saucepan and cook gently over a low heat for 5-6 minutes until the strawberries have softened. Remove from the heat and leave to cool. Meanwhile, pour the soya cream into a medium-sized saucepan and heat gently for 3-4 minutes until just starting to boil. 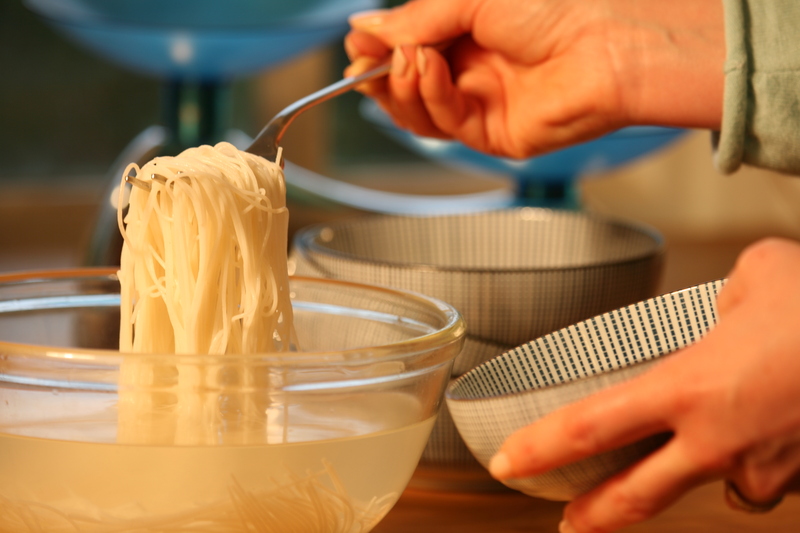 Mix the cornflour and 1 tbsp water together in a small bowl to form a smooth paste. Add to the cream and, using a whisk or a hand-held electric whisk, whisk for 2-3 minutes until the cream has thickened a little. Remove from the heat and leave to cool. Line a 450g loaf tin with a large piece of cling film. Pour the strawberry mixture into the cream mixture and stir in gently until all the cream mixture has changed colour. Pour the mixture into the loaf tin, ensuring that the strawberry pieces are evenly distributed on the bottom of the tin, and cover with the cling film. Place in the freezer for 3-3½ hours, or overnight, until set. To make the coulis, place the strawberries and xylitol or sugar in a heavy-based saucepan and cook gently over a low heat for 4-5 minutes. 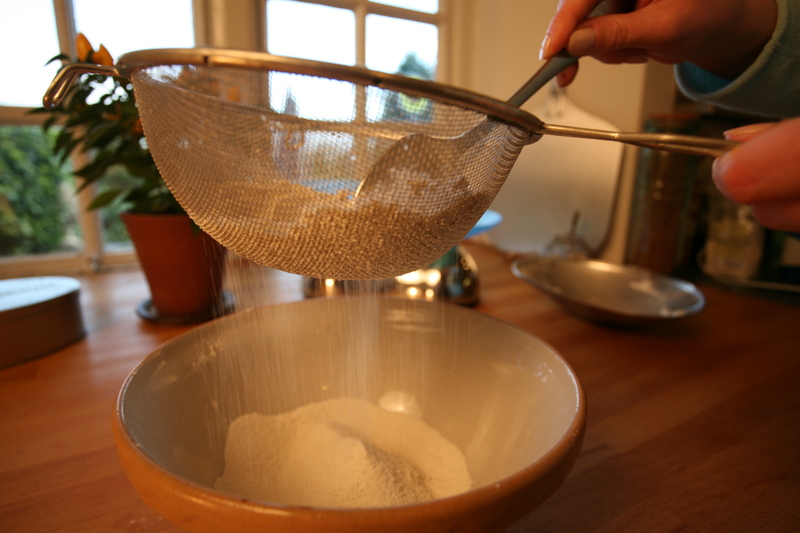 Push the mixture through a fine non-metallic sieve, discard the pulp and leave to cool. Before serving, remove the semifreddo from the freezer and leave to soften slightly at room temperature for 10-15 minutes. Cut the semifreddo into slices and serve with the coulis. It’s well worth making the effort to use fruit sugar, or xylitol, for the crumble if you can get hold of it. Both have a much lower GI (refined sugar is usually at least 5x higher) making this a healthier version of crumble. Plums themselves are high in fibre so they’re a great fruit to eat – and this recipe makes them very moreish! Heat the margarine in a large, heavy-based saucepan over a medium heat. Add the plums and cook, stirring occasionally, for 5 minutes. Add the honey, depending on the sweetness of the plums, and the star anise and cook for a further 10 minutes, stirring occasionally. Meanwhile, make the crumble. Sift the flours into a large mixing bowl and add the sugar. Add the butter and, using cold fingertips, rub it into the flours and sugar until the mixture resembles fine breadcrumbs. You can also do this in a food processor: simply sift the flours into the bowl, add the sugar and the margarine and blend briefly until the mixture resembles fine breadcrumbs. Spoon the plum mixture in a 2.5-litre ovenproof dish, removing the star anise as you find them. Crumble the topping mixture over the plums, making sure all the plums are covered. Bake for 20-25 minutes until browned on top. Remove from the oven and serve immediately. I’ve wanted to try restaurant raw food for a while, so I went to Saf Restaurant in Old Street on Friday. Billing itself as a “Botanical Fine-Dining Restaurant”, Saf promises “a delicious combination of flavours” – an ambitious promise for a vegan restaurant that cooks most of its dishes under 48°C to preserve nutrition. But, from the moment we stepped into the light, chic restaurant, the whole experience was wonderful. It’s a whole universe away from the usual worthy feel of a wholesome restaurant, with funky lighting and a super-stylish steel bar where you can sit and drink divine organic cocktails. The menus are a great mix of international dishes. I had Pesto au Poivre followed by Pad Thai and then Coconut Cheese Cake. 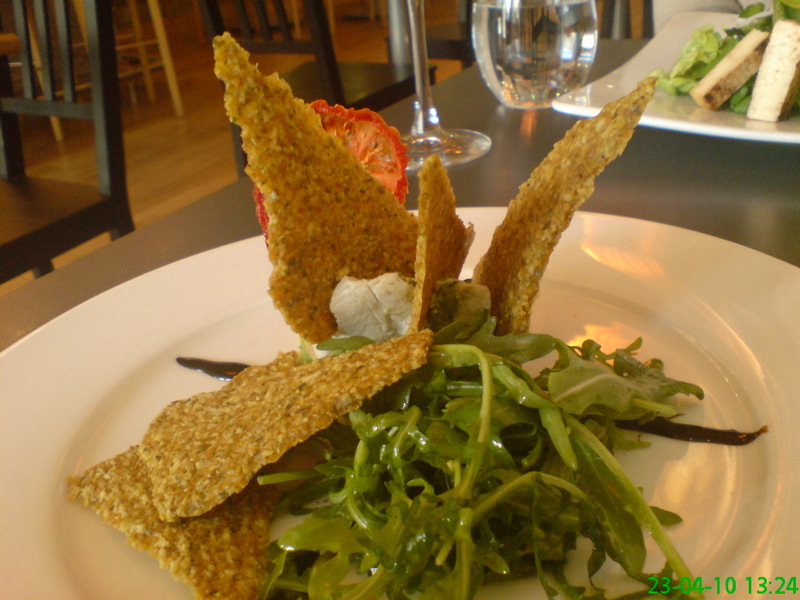 The Pesto au Poivre featured cashew nut cheese (a triumph of techniques in itself), flavoured with a sage pesto inside and a crust of pink peppercorns, and came with a rocket salad (with a beautiful balsamic reduction) and dehydrated flaxseed crackers and tomato. I’d have liked a little more sage pesto filling as I thought it was delicious and also, I must admit, I found the cashew cheese very slightly bland. But the fact that I was eating an exciting dairy-free cheese, with dairy-free pesto, in a beautifully-constructed dish was brilliant. Then onto the Pad Thai (although, after a long, long wait.) The noodles were made out of courgettes and carrots, and the knife work was stunning. Biting into the strips of veggies you felt that the chef was showing real admiration for the raw ingredients. 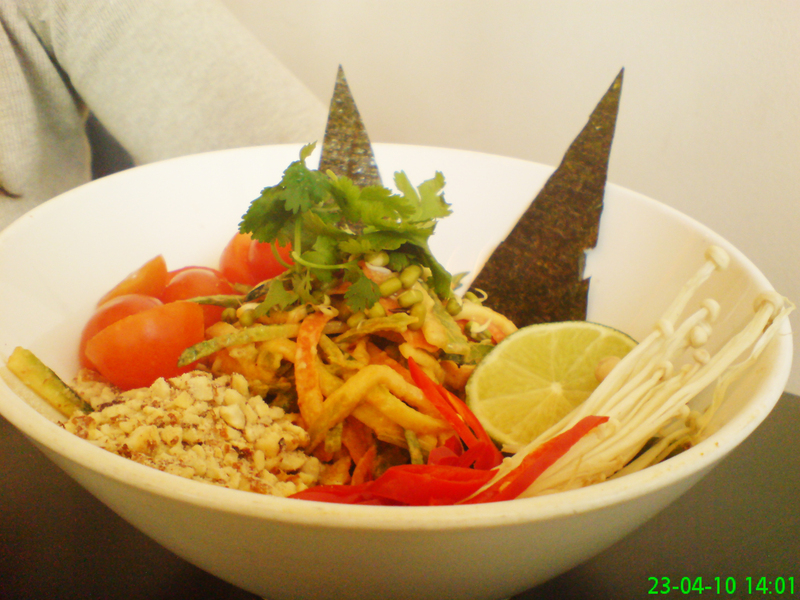 Mixed with enoki mushrooms, mung shoots, chipotle chillies and nori triangles, and covered with a smooth almond dressing, this was a real alternative to the traditional Pad Thai. It was at this point that I realised just how much work and skill goes into creating these dishes. I finished with a Coconut Cheese Cake which confirmed everything I was thinking about Saf. 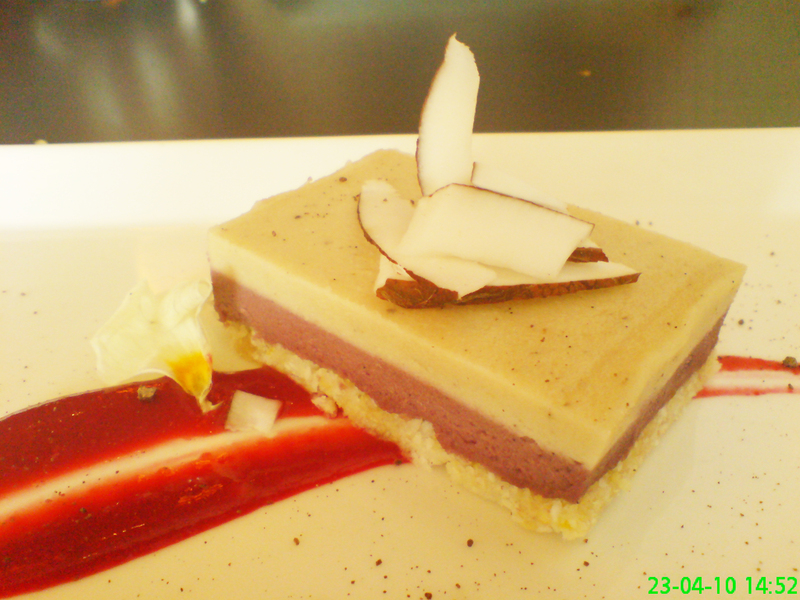 The combination of the sweet, chunky base, the fruit layer, the coconut cheese and the berry coulis was truly heavenly. And the coconut shavings and nasturtium leaf finished the gorgeous dish. This really is fine dining – and I can’t wait to go back! Saf is at 152-154 Curtain Road in Shoreditch and has just opened in Whole Foods Kensington, too. Great times – asparagus is in season! I’ve used it here with a herb-crusted rack of lamb. This recipe looks impressive yet it’s extremely easy. The combination of honey and pine nuts with the herbs for the lamb give this dish a suggestion of sweetness amongst the savoury tastes. And the roasted asparagus add more sweet, tender tastes. I’ve made this recipe using gluten-free polenta, instead of the traditional breadcrumbs to make a delicious crust – and it is well worth finding the quick-cook variety as this works the best. Instead of the usual Dijon mustard, I’ve used honey, both for the taste combination and because honey doesn’t contain any preservatives. Preheat the oven to 200°C/400°F/Gas 6. Score the layer of fat on each lamb rack and sprinkle salt over them. Heat 1 tbsp of the oil in a heavy-based frying pan over a medium heat. Add the lamb racks and sear for 2-3 minutes on each side, until browned all over. Put the herbs, garlic, pine nuts and polenta into a food processor and blend to form a paste. 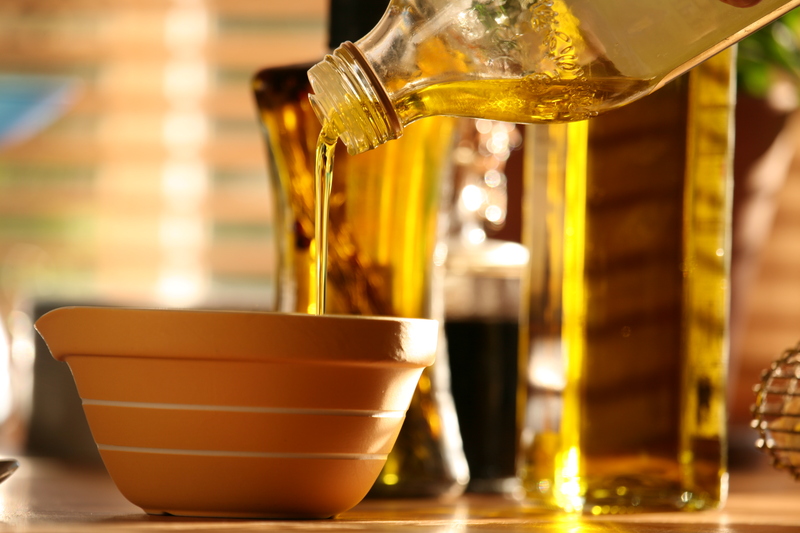 With the motor running, pour in 2 tbsp of the oil until well combined. Heat the honey in a small saucepan over a gentle heat until almost bubbling. When the lamb has browned, remove from the frying pan and place on a roasting tin, fat-side up. Using a pastry brush, brush a thin layer of honey over the top of the fat and then cover with the herb mixture, pressing down well. Cook the lamb for 25-30 minutes, depending on how pink you like the meat. When the lamb has been cooking for 20 minutes, place the asparagus on a baking tray. Drizzle with the remaining 1 tbsp oil, season lightly with salt and pepper, and roast for 10 minutes until tender. When the lamb is cooked, remove from the oven, cover with greaseproof paper, ensuring the ends of the paper are tucked under the tin, and leave to stand in a warm place for 5 minutes. Carve the lamb into cutlets, taking care not to dislodge the crust, and serve with the roasted asparagus and boiled new potatoes.